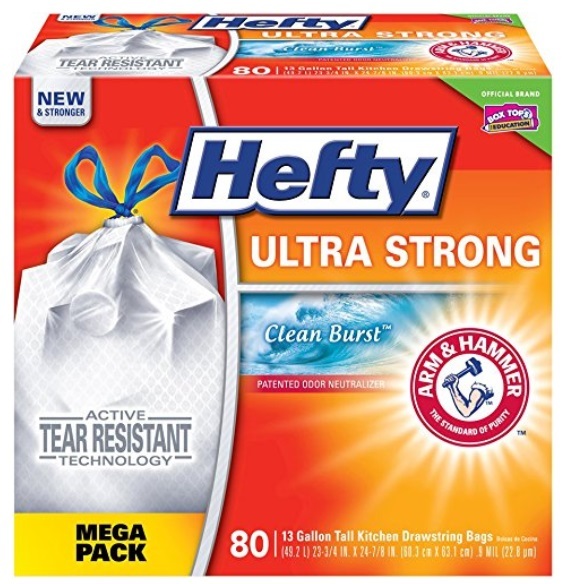 Amazon has the Hefty Ultra Strong Trash Bags (Clean Burst, Tall Kitchen Drawstring, 13 Gallon, 80 Count), for $12.72 use “Subscribe & Save” to get free shipping and bring the price down to only $12.08. Plus clip the $3 coupon that’s on the product page to bring the price down to only $9.08 shipped to your door. If you have 5 or more “Subscribe & Save” subscriptions a month you will save 15% instead of 5% and your total will be only $7.81 + Free shipping.